It’s that time of year again. It’s time to start compiling your gift lists (coming soon! ), Pinterest-stalking your friends, and getting the meal plan together for the exciting holiday gatherings you are going to put on! While this time of year is usually the time my cabinets begin to overflow with delicious food and my running shoes get worn more, it can get expensive throwing parties. Let me lend a hand! This year I’ve partnered up with Whole Foods Market to offer you some new ideas on how to liven up your table this season! As it is also the season of friendly and family gatherings, I’ve put together a sweets table that is bound to satisfy any sweet tooth at your next party. Not only that–Once you get to the end of this post you’ll find one more surprise! Pictured from left: Fair Trade Holiday Chocolate Bars from Divine (Milk Chocolate with Spiced Cookies & Dark Chocolate with Hazelnuts & Cranberries), Popcorn Indiana Red Hot Cinnamon Popcorn, RW Knudsen Spiced Pear Cider, Traderspoint Creamery Grassfed Nog, and Alter Eco Fair Trade Organic Truffles. 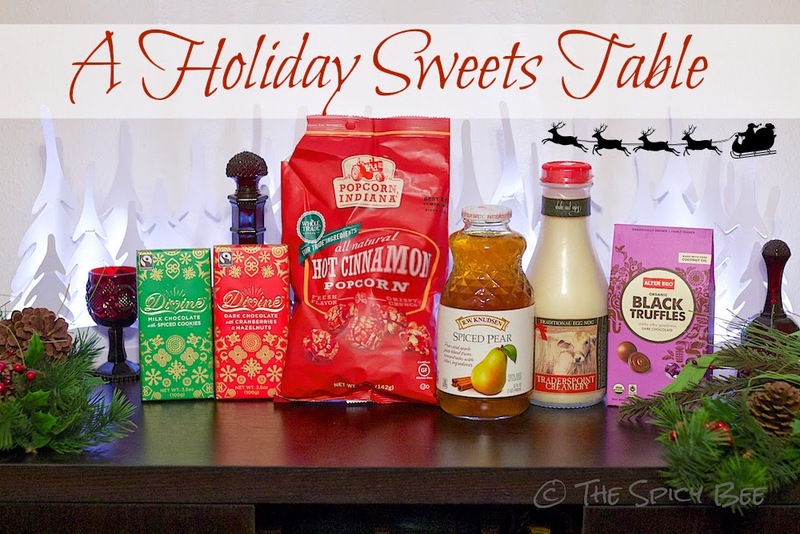 I picked these products to make both the salty-sweet and the chocolatey-sweet guests happy. I also put together a Spiced Pear Cocktail and a Virgin Chocolate Nog. With just a little finessing, I had a pretty amazing spread! 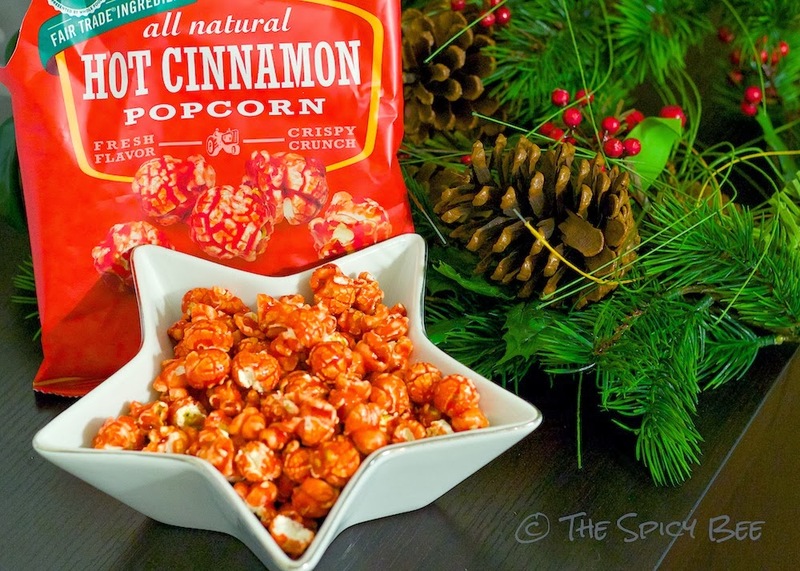 I enjoyed the color contrast the Popcorn Indiana Red Hot Cinnamon Popcorn provided and the spicy/sweet combination reminded me of what I wish Big Red Gum tasted like–sweet with just a hint of BAM–that flavor is bound to go quickly at any holiday gathering. 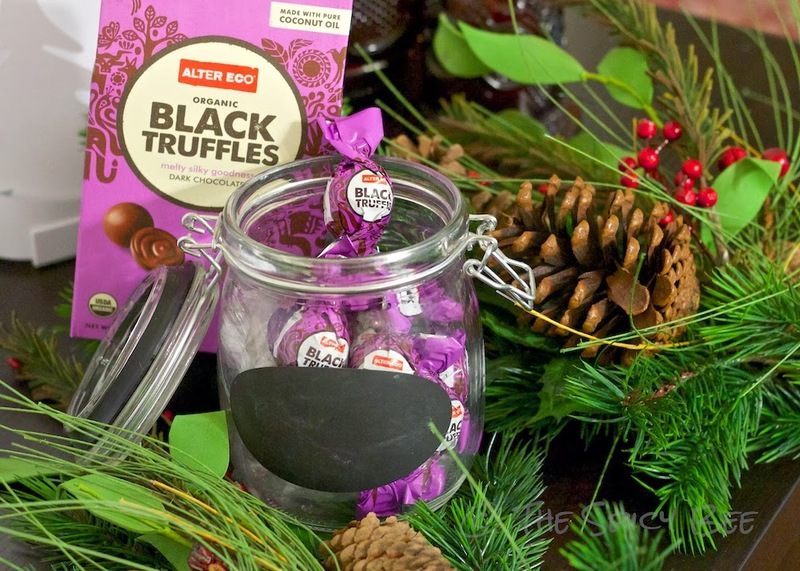 In contrast, the Alter Eco Fair Trade Organic Truffles would not only make great treats but even better stocking stuffers! I love how they are individually wrapped, almost encouraging you to eat just one and to savor it as it stands alone well. To drink I wanted to include both a fruity holiday option and a more traditional option with a slight twist. I came up with a Spiced & Spiked Pear Cocktail made from RW Knudsen Spiced Pear Cider, Bulleit Rye Whisky, and maple syrup. For the more traditional, I created a Virgin Chocolate Nog made up of melted chocolate, butter, egg nog, and topped with (what else) more amazing Fair Trade Holiday Chocolate from Divine (Milk Chocolate with Spiced Cookies or Dark Chocolate with Hazelnuts & Cranberries). My personal favorite is the dark chocolate with cranberry–it’s just too good to put down! Combine all ingredients into shaker and shake until chilled. 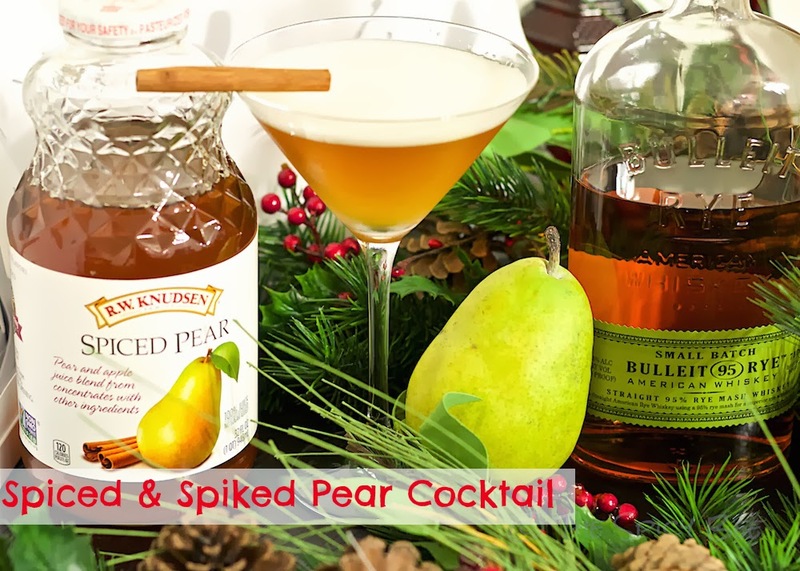 Serve in a martini glass adorned with cinnamon stick or slices of fresh pear. Recipe makes 1 cocktail. And for your guests that won’t be joining in the holiday spirits–try some chocolate egg nog! Pictured: Fair Trade Holiday Chocolate Bars from Divine (Dark Chocolate with Hazelnuts & Cranberries) & Traderspoint Creamery Grassfed Nog. In a glass bowl over a pot of boiling water, melt the chocolate and butter together until in a smooth, liquid form. Add in the eggnog slowly, whisking constantly, until the liquid resembles a deep, consistent color. Taste–if too chocolatey feel free to add more nog to the mixture, but be sure to bring the whole thing up to temperature before removing from heat. 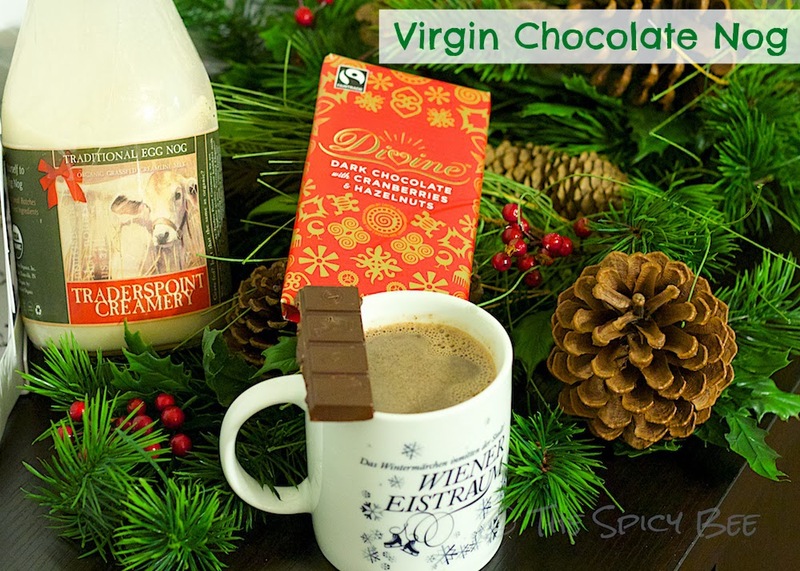 Pour into a wintery mug and serve with a line of chocolate. Recipe makes 1-2 mugs depending on size and taste. Not only am I giving some delicious ideas for holiday drinks and sweet combinations, I’m also giving away a Whole Foods Market $25 gift card! To enter, follow the instructions at the bottom of the post. The giveaway starts Friday, November 15th and goes through Wednesday November 20th!